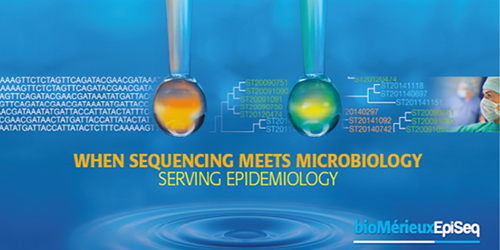 EpiSeq™ is an innovative next-generation sequencing (NGS) service dedicated to the epidemiological monitoring and control of healthcare-associated infections. This new service provides highly accurate information to health professionals for characterization of bacteria. By giving hospitals an improved understanding of the genetic markers of virulence and resistance, EpiSeq can help them understand how bacteria are transmitted, while enabling better containment of an epidemic, limiting the spread of infectious agents, and improving surveillance approaches. Results showing the genomic profile of the infectious agents and the genetic variations identified by sequencing will be sent to healthcare professionals in a customized, easy-to-interpret report. EpiSeg service will be launched first in Europe, followed by North America and Asia. The menu will initially consist of Staphylococcus aureus and will subsequently be expanded to include the other bacterial species most commonly responsible for healthcare-associated infections.